15 Voted against support for "Contras"
24 Sponsored Communist Party "Jobs Bill"
28 "NO WAR, NO WAY"
51 "John Conyers’ 50 Years of Service"
Charles B. Rangel was a far left Democratic member of the United States House of Representatives, representing the 13th district of New York. After his return from Korea and near-death experience, Rangel enrolled at New York University, earning a B.A. in 1957 and receiving his law degree from St. John's University Law School in 1960. His tenure in Congress has been marked by a continued activism and concern for his constituency. Rangel was one of the founding members of the Congressional Black Caucus and served at one time as its chairman. He has also been active on issues of trade and human resources. In 1987, Rangel, one of the leading opponents to South African apartheid, pushed the Internal Revenue Service to eliminate tax credits for taxes paid to the apartheid government of South Africa. In 1995, he helped to create a federal "empowerment zone" in Manhattan and authored the low-income tax credit to stimulate the development of affordable housing in urban areas. 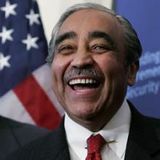 Early in 2003, Rangel proposed the reinstatement of the military draft as a way to deter the use of force and promote a peaceful resolution to the War in Iraq. David Dinkins rose through the Democratic Party organization in Harlem and became part of an influential group of African-American politicians that included Percy Sutton, Basil Paterson, Denny Farrell, and Charles Rangel. 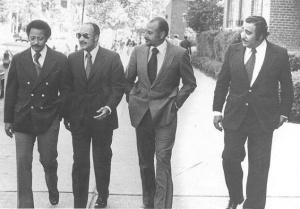 Rangel was a founding member of the National Conference of Black Lawyers. The National Conference of Black Lawyers and its allied organization, the National Lawyers Guild are the U.S. affiliates of the International Association of Democratic Lawyers. The IADL, was a "front" for the former Soviet Union and is still dominated by communist and socialist lawyers and legal organizations. A letter invitation was send out in the Fall of 1970 by the Ruth Gage-Colby Testimonial Committee, a group of communists, radical marxists, liberals and liberal dupes to honor Ruth Gage-Colby, one of the top communist-sympathizers in the Hanoi Lobby and "a longtime leader of the Women's International League for Peace and Freedom" WILPF, which was under heavy CPUSA influence, if not dominance, much like Women Strike for Peace WSP was. A description of her activities from this pamphlet will appear in the Keywiki section under her name. Needless to say, her record of support for communist fronts and causes, both CPUSA and Socialist Workers Party SWP, i.e.NPAC, is extensive and well documented. Victor Reuther - avowed "socialist"
Others also have long records of support for CPUSA and SWP fronts and causes. There were very few genuine liberals on that list of 57 people, including 15 present or recently retired U.S. Representatives and Senators. They will be listed on the Keywiki site for Ruth Gage-Colby and under their own names. In 1972, a coalition of congressmen, radical activists and some communists spearheaded a drive to relax relations with Fidel Castro's Cuba. Under, the auspices of Sen. Ted Kennedy (D.- Mass.) and Sen. Harold Hughes (D.-Iowa), a two day conference of liberal scholars assembled in April, in the New Senate Office Building to thrash out a fresh U.S. policy on Cùba. Among congressional sponsors of the seminar were Sen. J. William Fulbright (D.-Ark.) and Sen. Jacob K. Javits (R.-N.Y.), both influential members of the Senate Foreign Relations Committee; Sen. George McGovern (D.-S.D. ), Rep. Bella Abzug (D~-N.Y.) and Rep. Ron Dellums (D.-Calif.). Congressmen Joseph Addabo (D - NY), Herman Badillo ( D - NY), Alphonzo Bell (R -CA), Jonathan Bingham (D - NY), John Brademas (D -Indiana), Donald Fraser (D - Minn.), Seymour Halpern (R - NY), Lee Hamilton (D - Ind. ), Michael J. Harrington (D - MA), Patsy Mink (D -HI), Parren Mitchell (D - MD), Charles Rangel (D - NY), Thomas Rees (D - CA), William Fitts Ryan (D - NY), Ogden Reid (D - NY), Benjamin Rosenthal ( D - NY), Morris Udall ( D - AZ). 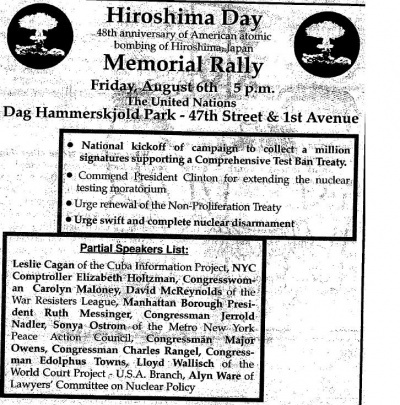 Secretary of the New York State Communist Party USA, Michael Myerson was among the observers. One panelist, John M. Cates, Jr., director of the , Center for Inter-American Relations, matter of factly remarked during the discussions: "So why are we here'? We're here so Sen. Kennedy can have a rationale to get our country to recognize Cuba." The conference was financed by a New York-based organization called the Fund for the New Priorities in America, a coalition of groups clearly sympathetic to many pro-Communist causes. The Fund was virtually the same group as the Committee for Peace and New Priorities, a pro-Hanoi group which bought an ad in November 1971 in the New York Times demanding Nixon set a Viet Nam withdrawal date. Both the Fund for the New Priorities and the Committee for Peace, were located at the same address in New York. Congressional Progressive CaucusVice Chairman Raul Grijalva and Danny Davis, joined "Ways & Means" late in the year. In 1998 Charles Rabgel Democrat was listed as a member of the Congressional Progressive Caucus. As of February 20 2009 Charles Rangel was listed as a member of the Congressional Progressive Caucus. In May 2013, Charlie Rangel was listed as an associate member the of the Congressional Asian Pacific American Caucus. Rangel was associated with the Soviet front World Peace Council. A luncheon was held to honor World Peace Council president Romesh Chandra that was attendedby California Congressmen Philip Burton, Don Edwards, Ron Dellums and New York rep. Charles Rangel. "Women for Racial and Economic Equality will honor civil rights activists Julia Wilder and Maggie Bozeman at its First Annual Fannie Lou Hammer Awards dinner on Saturday, February 26." US Rep. Charles Rangel sent a letter regretting that he was unable to attend, but congratulated the honorees and the World. Noted scholar and political activist Angela Davis brought the multi-racial audience to its feet in her moving tribute to Winston. 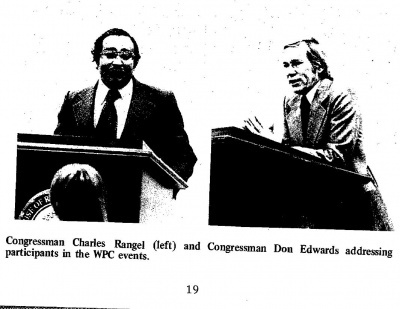 In 1981 Charles Rangel was a Vice President of Independent Voters of Illinois-Independent Precinct Organization. Charles Rangel endorsed a March 25 1983 New York Democratic Socialists of America tribute event for DSA member Ruth Messinger. In 1990, as part of the New Democratic Coalition, Charles B. Rangel personally endorsed the New York mayoral campaign of well known Democratic Socialists of America member David Dinkins. In mid 1993, a National Network on Cuba meeting in Chicago endorsed a call for strong lobbying support for HR 1943, the Free Trade With Cuba Act, introduced into Congress by Charles Rangel. Other prominent initiators included Cuban Intelligence agent Philip Agee, academic Noam Chomsky and Congressman John Conyers. 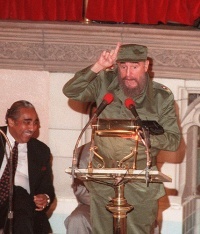 Rep. Charles Rangel, a frequent critic of the U.S. embargo against Cuba, met with Fidel Castro on a trip to the island in 2002, but only acknowledged that the Cuban government picked up part of the tab when a watchdog group began making recent inquiries. The New York Democrat changed his travel disclosure form for the April 2002 trip and reimbursed the Cuban government and a New York grocery store owner $1,922 for his son's expenses after the Center for Public Integrity, a nonpartisan group that focuses on open records, raised questions about the trip. House ethics rules permit private sponsors of lawmakers' trips to cover the cost of the member of Congress and one relative -- in Rangel's case, his wife Alma, who also went on the trip. The government watchdog group, which released an extensive review of congressional travel, noted that congressional travel disclosure forms "are supposed to make the sponsor and purpose of privately funded trips transparent to the public. But according to the group, Rangel initially listed a group that was conducting a bird study in Cuba at the time, the Minneapolis-based Sian Ka'an Conservation Foundation, as the sponsor of the trip. On an amended form -- filed in April -- Rangel added the Cuban government and grocery owner John Catsimatidis as sponsors. Rangel's chief of staff, George Dalley, told the center that Rangel and his staff did not know the Cuban government had paid for part of the trip until they were contacted by the group. The most important thing is that Rangel corrected the mistake he made, Dalley told the group. Calls to the congressman's office were not returned. The report also suggests that Rangel may have violated another House ethics rule. His office did not say whether it had filed a required report that a foreign government paid for some of his trip. Some Cuba observers, however, said they have wondered whether the Cuban government has paid some expenses in an effort to foster relationships with members of Congress, which in recent years has batted down efforts to relax the embargo that prevents most U.S. companies from doing business with Cuba. I have long suspected that the Cuban regime illegally finances and arranges travel and other activities for members of Congress, said Rep. Lincoln Díaz-Balart, a Miami Republican who is a staunch defender of keeping economic sanctions against Castro in place. Rangel, who met with Castro as far back as 1988 as part of a congressional trip, reported the 2002 trip was for "education and fact finding. According to the center, the group attended talks about bird conservation, dined at the U.S. Special Interests Section (the American diplomatic mission in Cuba) and met with Castro. The center noted that Catsimatidis was interested in traveling to Havana "to familiarize himself with preparations for the consecration of a Greek Orthodox Cathedral of St. Nicholas in Old Havana. Rep. Marcy Kaptur, an Ohio Democrat who was also on the trip, said at the time that she and Rangel met with Castro and discussed the case of an American who fought in the Cuban Revolution but was later executed. Kaptur said at the time that top Cuban officials assured her they would consider returning Yanqui Comandante William Morgan's remains. His body has not been returned. In July 1996, the Democratic Socialists of America Political Action Committee endorsed Charles, NY 15 in that year's Congressional elections. H.R. 950, the Job Creation and Infrastructure Restoration Act of 1997 was introduced in the 105th Congress on March 5, 1997 by Congressman Matthew Martinez of California. It had 33 original co-sponsors, including Charles Rangel. The primary purpose of this emergency federal jobs legislation was to provide much needed jobs at union wages to crisis ridden cities by putting the unemployed to work rebuilding our nation's infrastructure (schools, housing, hospitals, libraries, public transportation, highways, parks, environmental improvements, etc. $250 billion is authorized for emergency public works jobs over a five year period. Signatories included Rep. Charles Rangel. 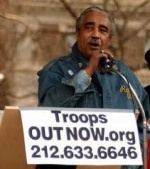 Rangel was an early and vocal opponentof the Iraq War, with his colleague Major Owens. Signatories included Charles B. Rangel. Charles Rangel signed the letter. In July and August 2008, radical Jewish "peace" organization Brit Tzedek chapters held more than a dozen home district meetings with their Congressional representatives. Meetings were held in California, Colorado, Georgia, Illinois, Maine, Massachusetts, Michigan, New York, Oregon, and Washington. 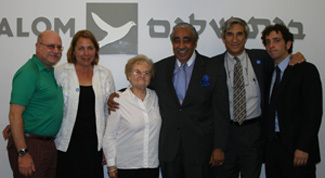 "It was so exciting to have Rep. Charles Rangel (D-NY) meet our delegation at Brit Tzedek’s NYC office. He was enthusiastic and positive about our work." In 2008 Rangel was endorsed by JStreet PAC. ""What troubles me most about the wars in Iraq and Afghanistan is the total indifference to the suffering and loss of life among our brave young soldiers on the battlefield," Congressman Rangel said. "The reason is that so few families have a stake in the war which is being fought by other people's children. The test for Congress, particularly for those members who support the war, is to require all who enjoy the benefits of our democracy to contribute to the defense of the country. All of America's children should share the risk of being placed in harm's way." Rep. Rangel addressed Alliance for Retired Americans members in D.C., April 18, 2011. Congressional endorsers of the proposal included Charles B. Rangel. Signatories included Rep. Rangel . In 2013 Progressive Democrats of America assigned activists to deliver their material to almost every US Congressman and several Senators. Diane Lane-Hymans, was assigned as contact for Rep. Rangel. The letter, highlighted several “important steps” that the current government has taken to “strengthen its democratic system and expand the right to vote to all citizens,” including those living outside of the country, who will be voting by absentee ballot for the first time in February. Since the election of Mauricio Funes, the first President from the Marxist Farabundo Martí National Liberation Front (FMLN) party, the government has increased the number of polling places four-fold to increase accessibility, especially in rural areas. Charles B. Rangel is a past recipient of Asian Americans for Equality's annual Dream of Equality award. The Alliance for Retired Americans Political Action Fund endorsed Charles B. Rangel in 2014, also 2012. ↑ Subversive Involvement in the Origin, Leadership, and Activities of the New Mobilization Committee to End the War in Vietnam and Its Predecessor Organizations, Staff Study, House Internal Security Committee, HISC, 1970, P. 3, but on pp. 40, 44 and 52 he was listed as an identified member of the CPUSA, in [[Subversive Influences in Riots, Looting and Burning, part 4,Newark, NJ., HCUA, April 24, 1968, p. 1917. This page was last modified on 19 May 2018, at 12:58.